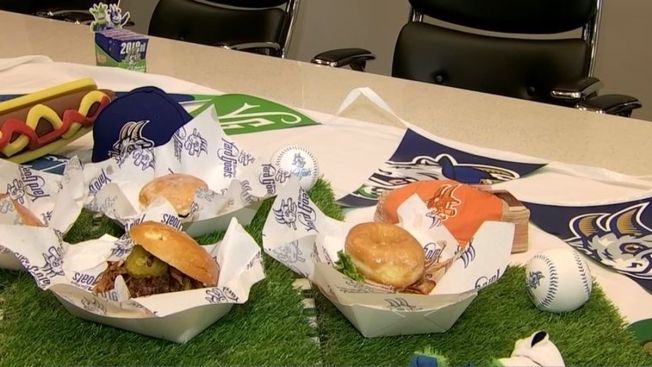 The Hartford Yard Goats unveiled some extreme culinary creations for the 2018 season. First pitch is scheduled for 7:05 p.m. The Hartford Yard Goats will open their second season at Dunkin' Donuts Park on Thursday. The Double-A affiliate of the Colorado Rockies will play the New Hampshire Fisher Cats in the home opener with first pitch scheduled for 7:05 p.m.
"We’re looking forward to opening the season tomorrow, and welcoming fans back into Dunkin’ Donuts Park," Mike Abramson, the team's general manager, said. "We’ve spent a lot of time this offseason enhancing the ballpark experience, and the promotional show, and I’m excited to see it all come together." The team is led by new manager, 33-year-old Warren Schaeffer, who comes to Hartford from the organization's Single-A club in Asheville, North Carolina. The team sold out 41 of its 68 home games last season, including the final 21 games, and the ballpark won Ballpark Digest's Team of the Year award. Dunkin' Donuts Park also was voted the best Double-A ballpark in the country by fans. "We are extremely excited to start the Yard Goats season tomorrow night," Yard Goats Director of Broadcasting and Media Relations Jeff Dooley said. "There is always something special about opening day and sharing the memory with family, friends or co-workers. We look forward to another fantastic season at Dunkin’ Donuts Park and watching the future stars of the Major Leagues." The Rockies' number one overall prospect, infielder Brendan Rodgers, is back with the team for the start of the season. Pitcher Ryan Castellani, also seen as an eventual Major Leaguer, is back in Hartford. The team is introducing several new food items for the season, including a "donut dog," and will have live goats at every home game. Gates open at 6 p.m. Thursday. Among the promotions scheduled for the home opener are fireworks from Atlas after the game and a magnet schedule giveaway. NBC Connecticut anchor Mike Hydeck will be among the fans who are lucky enough to throw out a ceremonial first pitch before the game. Opening day will likely sell out but you can buy individual game tickets for the rest of the season by calling 860-246-GOAT (4628), visiting the team's website www.yardgoatsbaseball.com or by going in person to the box office at Dunkin' Donuts Park. Thursday's game kicks off a seven-game homestand for the Yard Goats in Hartford.